Haute couture . . . tattoos? Black Lace Skin Jewelry is glamour in the form of a hypo-allergenic, adhesive tattoo. Made in the USA by an award-winning jeweler and a graphic designer, this skin jewelry has a medieval influence and an edgy, modern look. Easy to press and peel off, they only look expensive. Love the medieval look of "Game of Thrones?" Designers Mary Anne Richman and Bonny Katzman cleverly mixed Gothic elements, Swarovski crystals, and modern edge to make their Black Lace Skin Jewelry look distinctive and dramatic. Simple to press on and peel off, these temporary tattoos are made of hypoallergenic adhesive and inks that meet all federal standards. The Makers can control the quality because Black Lace is completely made in the US. 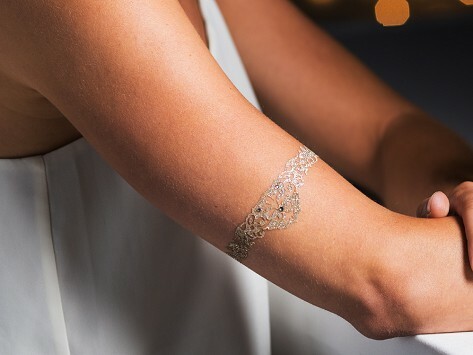 Worn alone, these temporary jewelry tattoos are sophisticated and eye-catching. Worn with real jewelry, they add drama. Treat them with care and they’ll stay on your skin for up to three days, giving you a diamond look for a down-to-earth budget.